Leading trainer Trevor Andrews has another professional juvenile in his stable following the strong all the way win by Trade Fair gelding Trademark today. Paul Harvey extracted plenty out of his mount when challenged late in the race, giving the ‘Pontiff’ three winners this week including the win aboard Andrews’ stable star Lucky Street last Saturday. In a stable quinella, Andrews also saddled runner-up The River who won impressively a fortnight ago and fought it out bravely after racing outside the leader under the 58kg top weight. The pair will now target the 2yo Magic Millions Classic at Pinjarra in a fortnight at set weights and Andrews suggested there was little between them. “I actually lead towards Trademark just because of the pull in the weights”. 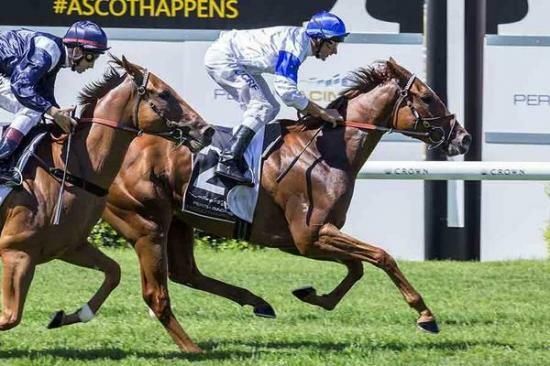 “At level weights in the Magic Millions it should be an interesting race”. “You never get too far ahead of yourself but I am pretty happy with both of them”. It was another solid performance from Bunbury filly Diamond Princess who followed the winner the entire way and ran a clear third. Debutante Dainty Tess didn’t look comfortable in her action prior to the home turn and although finishing fourth was more than seven lengths off the pace.